Rare and Endangered Plants: Three local plant species are listed as threatened or endangered. Two additional listed species occur south of the project area; suitable habitats for these species occur within the project boundary. Seagrasses and Algae: Where data are available, eelgrass meadows appear stable and becoming denser; more data are needed. Algae are abundant, not necessarily indicating poor water quality. Tidal Wetland Vegetation: Much of the historic wetland area in the Coos estuary has been permanently converted for human uses. Surviving wetlands host diverse and relatively stable plant communities. Terrestrial Vegetation: The spatial extent of mature forests continues to decline, becoming more fragmented; diseases (e.g., Swiss needle cast) limit production and cause high tree mortality. This chapter includes four data summaries: Rare and Endangered Plants, Seagrasses and Algae, Tidal Wetland Vegetation, and Terrestrial Vegetation— which describe the status and trends (where data allow) of tidal wetland and upland vegetation in the lower Coos watershed. Rare and Endangered Species: This data summary compiles information on five threatened or endangered plant species that occur within or near the project area (pink sand verbena, salt marsh bird’s beak, silvery phacelia, Western lily, and wolf’s evening primrose). Information used to compile this summary came primarily from agency reports. The majority of information for the only federally listed species (Western lily – Lilum occidentale) came from the most current United States Fish and Wildlife (USFWS) Western lily management report (USFWS 2009). Information for the remaining four species were compiled from a variety of agency reports (Rittenhouse 1999, BLM 2006, Brown et al. 2013, ORBIC 2013), including agency reports prepared by the Institute for Applied Ecology (Giles-Johnson et al. 2013; Giles-Johnson and Kaye 2012; Giles-Johnson et al. 2011; Kaye et al. 2006) and by Currin and Meinke (2004). Other sources included peer-reviewed literature (Chuang and Heckard 1971, Rittenhouse 1996), book sections (Imper 1997a, 1997b; Kaye 2004), and a graduate student thesis (Julian 2012). Seagrasses and Algae: The spatial extent of eelgrass in the Coos estuary has been mapped by the United States Environmental Protection Agency (USEPA)(Clinton et al. 2007). Eelgrass monitoring data are available through the South Slough National Estuarine Research Reserve (SSNERR), which has participated in SeagrassNet (a global eelgrass monitoring program) since 2004 (SSNERR 2015). The SeagrassNet monitoring data have supported a number of publications and unpublished technical reports (Rumrill 2006; Rumrill and Sowers 2008; Cornu et al. 2012). Historic information about algae in the Coos estuary was provided by a 1944 publication and dissertations from the 1980s (Sandborn and Doty 1944; Pregnall 1983; Hodder 1986). More current algae data were provided by the SSNERR Site Profile (Rumrill 2006) as well as a report from the Western Ecology Division of USEPA (Nelson et al. 2007). 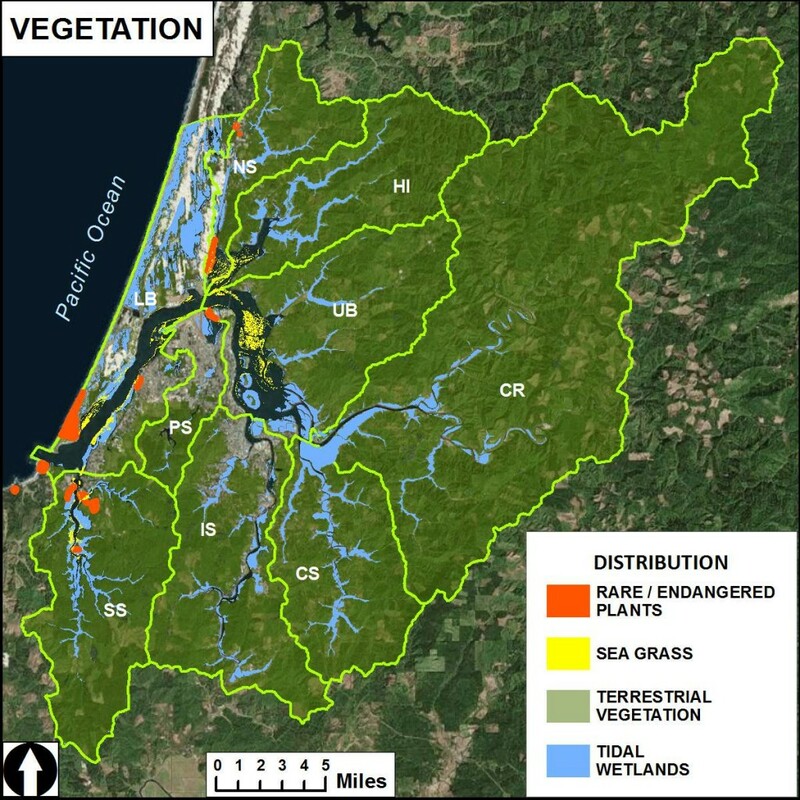 Tidal Wetland Vegetation: The most comprehensive collection of tidal wetland vegetation data came from a report compiled by SSNERR and the Confederated Tribes of Coos, Lower Umpqua, and Siuslaw Indians (CTCLUSI)(Laferriere et al. 2010). This report was supplemented by other SSNERR publications and technical reports (Cornu 2005a, 2005b, 2005c, 2005d; Hamilton 2011). Additional data are available from Coos Watershed Association publications (CoosWA 2006, 2010). USFWS provided information about the spatial extent of wetlands in the project area (USFWS 1979, 2003). Estimates of historical wetland loss (within the project area, statewide, and regionally) were provided by peer reviewed literature and technical reports (Hofnagle et al. 1976, NRC 1996, Good 2000, Borde et al. 2003, CoosWA 2006). Rare and Endangered Species: Local rare and endangered species population data were compiled from surveys completed as long ago as the early 1990s and as recently as 2013, depending on species and location. Identifying status and trends for many of these species was challenging. For example, of the multiple known populations of salt marsh bird’s beak (Chloropyron maritimum ssp. palustre), only one population is regularly surveyed, and most populations have not been surveyed since 1999. Another major limitation is lack of known extent of these plant populations, especially on private land. This is particularly important as newly discovered populations are most likely to occur on private lands, since most habitats have already been extensively surveyed on public lands (USFWS 2009). Aquatic Vegetation: The data describing the spatial extent of seagrasses are outdated. The most current characterization of the distribution of seagrasses in the project area came from an analysis of 2005 aerial photos (Clinton et al. 2007). It won’t be until another eelgrass mapping effort is completed for the Coos estuary (local agencies are currently working to secure funding) that researchers will be able to characterize trends in the spatial distribution and relative density of eelgrass beds. SeagrassNet data from a single site in South Slough (SSNERR 2015) are the only long-term time-series data available that characterize eelgrass meadows in the Coos estuary. As a result, the scope of long-term eelgrass trends assessments are limited exclusively to the South Slough Subsystem (Rumrill 2006; Rumril and Sowers 2008; Cornu et al. 2012; SSNERR 2015). Since habitat conditions in South Slough are not necessarily representative of the whole system, eelgrass trends may be distinct in different parts of the estuary. More information is needed to determine the status of eelgrass in the estuary as a whole. Historic information about the production of algae in the lower Coos estuary is available from the 1940s and the 1980s (Sandborn and Doty 1944; Pregnall 1983; Hodder 1986). More recently, Hessing-Lewis et al. (2011) have studied algae-eelgrass interactions. However, no recently collected information describing the extent or production of algae in the Coos estuary is currently available. Tidal Wetland Vegetation: Analysis of the National Wetlands Inventory (NWI) habitat classification shapefiles is limited by uncertainties in potential differences in how wetlands were classified in 1979 and in 2003. For example, the amount of “unclassified” land increased by more than 150,000 acres from 1979-2003 (USFWS 1979, 2003). Due to this sizable change, it’s difficult to tell if analytical results indicating apparent losses of any wetland class between 1979 and 2003 represent actual trends or simply a reclassification from a formerly classified habitat to an “unclassified” habitat. Similarly, reclassification from one habitat class to another may appear as an apparent gain or loss, but could reflect a simple reclassification without any net change in wetland area. Additional work, beyond the scope of this project, needs to be undertaken to clarify the NWI classifications for the Coos estuary. Similarly, for Hamilton’s (2011) evaluation of tidal wetland plant community diversity trends in South Slough sites, important methodological differences between survey years complicated her analyses. Specifically, she noted that plot size bias may have influenced estimates of diversity indices. She adds that the effects of marsh surface elevation/inundation period were not controlled for during data collection. Terrestrial Vegetation: This data summary discusses available information on forest structure, forest fragmentation, vegetation type, species and common associates, and the status and causes of damaged and diseased forests. The National Oceanic and Atmospheric Administration’s (NOAA’s) Coastal Change and Analysis Program (C-CAP) provided land cover data (raster-based maps) from remote sensing imagery. These data, collected at five year intervals, are intended to identify changes to landscape patterns and habitats on large scales (e.g., watershed or county scales). Overall the raster data have an 85% accuracy, but this varies by location and date. Horizontal accuracy of the 1996 and 2010 land cover datasets was 2 pixels or less. Horizontal accuracy of the 1996 and 2010 forest fragmentation datasets was 1 pixel or less. Oregon State University’s Department of Forest Ecosystems and Society in collaboration with the United States Forest Service’s Pacific Northwest Research Station model forest species coverage for western Oregon as part of the Landscape Ecology, Modeling, Mapping and Analysis (LEMMA) program (http://lemma.forestry.oregonstate.edu/). LEMMA’s models characterize a wide variety of species attributes for the region’s terrestrial habitats including conifer richness, hardwood richness, trees species percent coverage, shrub coverage, forb coverage, and forest type. The LEMMA program also provided spatial forest structure data, which were analyzed using GIS methods. Structure information, including mature forests cover, late successional/old growth forest cover, and non-forest land, was compared to ownership (county lands were moved from Private to Local Government). The Oregon Department of Forestry (ODF) flew Swiss needle cast (SNC) aerial surveys using two mile transects across Oregon and northern California (Kanaskie and Norlander 2014). Observers approximated coverage of yellowed foliage onto maps based on the aircraft’s position. They also classified the disease as either moderate or severe. A random sample of 14 mapped polygons was ground-checked – all contained Swiss needle cast disease. The United States Department of Agriculture (USDA) and ODF make forest disease aerial survey data (1980-2013) available online (USFS 2014). Aerial digital mapping methods were the same as described above from 2003-13. Prior to 2003, data were collected manually by two aerial observers sketching diseased areas on paper, then later combining their observations into one map. Because of the discrepancy in the two methods, only 2003-13 data were used in the Terrestrial Vegetation data summary. It should be noted that the Laferriere et al. (2010) study was designed primarily to assess the status of Assiminea parasitologica (AP), a small, invasive snail native to Japan. Although vegetation sampling occurred in a variety of habitats, including both low and high marshes across a wide salinity range, data collection was limited by design to areas that are most likely inhabited by AP. For more information about AP, refer to Chapter 18: Non-Indigenous/Invasive Species. Unfortunately, there is no written historic record of marsh vegetation in the lower Coos estuary. Consequently, it is difficult to determine the precise amount of wetland within the project area that has been lost to other uses since the early 19th century. Analyses of sediment and plant material and other analytical techniques indicate that marshes within the lower Coos watershed have been severely disturbed by human activities (Hofnagle et al. 1976, Good 2000, CoosWA 2006). Arriving at an exact estimate of wetland acres converted has proven to be difficult in the absence of a comprehensive historical reconstruction of the original extent of tidal wetlands in the Coos estuary (e.g., Benner 1992). In particular, there is little information available about the historic extent of scrub-shrub and forested tidal wetlands in the Coos estuary, which would have been almost entirely converted prior to NWI wetland mapping in 1979. The Tidal Wetland Vegetation data summary does not reflect the true loss of those habitats and recognizes the omission as a critical data gap. Finally, it is important to note that the studies used in this data summary do not all make use of the same standardized sampling or analysis method. Care should be taken when comparing the results and conclusions of one study against another. Terrestrial Vegetation: LEMMA models are most useful (and accurate) at landscape or regional scales, and are considered much less useful at the stand scale (LEMMA 2014a, 2014b). The project area boundaries are slightly smaller than a landscape scale so there will be some discrepancies between the modeled attributes reported and those observed on the ground. In addition, the models only apply to lands that currently support at least 10% tree cover. The purpose of using the LEMMA data was to compile a picture of species distributions for the project area as a whole. Aerial surveys of SNC disease are a conservative estimate since only those diseased trees visible from the air are counted. The same holds true for aerial surveys conducted for other damaged trees (e.g., bears damage is an underestimate). In addition, accuracy of aerial surveys depends on surveyor experience (sketch-mapping is highly subjective), weather, time of day, time of year and visibility. Observers evaluate and record forest health at a rate of 30 seconds/mile. Accuracy assessments have not been completed for the USFS 2014 annual surveys. However, the data are ground-checked to ensure appropriate coding on the maps. The map information should only be used as an indicator of insect and disease activity and need to be ground verified for other uses. Old Growth Forests: The old growth forest dataset (LEMMA 2014b) was developed for regional monitoring of old growth forest status and trends. Spatial accuracy is based on a regional scale and may be suitable for use at 5th or 6th field watershed scales. The entire project area is slightly larger that a 5th field watershed, so fits within that criteria, though the subsystems we consider are often times smaller (e.g. Pony subsystem is a 7th field watershed) and so accuracy becomes questionable at that scale. Benner, P. A. 1992. Historical reconstruction of the Coquille river and surrounding landscape. Sections 3.2 and 3.3 in: Oregon Department of Environmental Quality (ed.). Near coastal waters national pilot project: The Coquille river, Oregon. Action plan for Oregon coastal watersheds, estuary, and ocean waters, 1988-1991. Oregon Department of Environmental Quality, Portland. Borde, A. B., R. M. Thom, S. Rumrill, and L. M. Miller. 2003. Geospatial Habitat Change Analysis in Pacific Northwest Coastal Estuaries. Estuaries 26 (4B): 1104-1116. Kaye, T., N. Brian, D. Segotta, and N. Bacheller. 2006. Conservation Stgrategy for Pink Sand-Verbana (Abronia umbellata ssp. breviflora). Prepared by the Institute for Applied Ecology for Bureau of Land Management, USFS Siuslaw National Forest, and Oregon Department of Parks and Recreation. 44 pp. National Research Councile (NRC). 1996. Upstream: salmon and society in the Pacific Northwest. National Academy Press, Washington, D.C.
Development, National Health and Environmental Effects Research Laboratory, EPA/620/R-07/002.